The outbreak in west Cork has affected 51 children with two having to be hospitalised. THE HEALTH SERVICE Executive (HSE) has urged parents to make sure their children are vaccinated against measles in the wake of an outbreak in west Cork that has affected 51 children. Two children have been hospitalised by the outbreak with a GP in Schull, Dr Brian O’Connell treating between 20 and 30 of the cases along with his partner. He said he was “very surprised by how contagious it is”. “I don’t think I’ve ever seen a case of genuine measles in my 20 years until recently and I am quite taken aback by how transmissible it is,” he told RTÉ Radio’s This Week programme earlier today. He said most of the children who were affected had not been vaccinated and linked it to the controversy surrounding the MMR vaccine back in 1998 when British doctor Andrew Wakefield suggested a link between immunisation against measles and autism. This link was later entirely discredited by numerous other investigations and Wakefield was later struck off by the British General Medical Council. On the same programme, the HSE’s Assistant National Director of Health Protection, Dr Kevin Kelleher, said there was an almost a 100 per cent chance of contracting measles from somebody who has got measles if you are not vaccinated. He said that contracting measles can lead to pneumonia and hospital admissions while one in a hundred can end up in an Intensive Care Unit and up to three per thousand people affected by measles can die . In an earlier statement, he said: “Most of the children infected in Cork are teenagers and 88 per cent of cases have never received any dose of MMR vaccine. The HSE says that the MMR vaccine is routinely provided to children at 12 months of age and again at preschool age. Older children who did not get the MMR vaccine at these ages need to be vaccinated and their parents should contact their family doctor. Children younger than 13 years of age who missed out on MMR vaccine can still get it free of charge from their GP while older children and teenagers can get the vaccine free but may have to pay an administration fee. 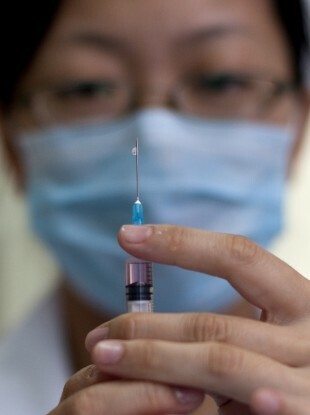 Email “HSE urges parents to vaccinate children after measles outbreak in Cork ”. Feedback on “HSE urges parents to vaccinate children after measles outbreak in Cork ”.